Life is all about finding a balance. The same holds true when it comes to finding the best cheap dog food on the market. While you’ll want to give the best to your dog, it may simply not fit into your budget. That’s okay! You do not have to feel guilty about letting your best friend down. You can find high quality dog food that won’t break the bank. We will also show you how you can supplement this food so that your dog’s diet is the best that it can possibly be. 3 What is the best cheap dog food you use and why? It won’t do you any good to buy the most expensive and healthy brand of dog food out there if your dog simply doesn’t like it. You certainly have food preferences and your dog does too. When you are first looking for a food that you can afford you also have to make sure that your dog loves it. This can take some trial and error but at the end you’ll both be happy. Don’t be angry if you bring home a bag of dog food and your pooch refuses to eat it. This is all part of the process and it won’t take long before you find a quality yet cheap dog food that your friend can’t wait to gobble down. Real ingredients are essential to a dog’s diet and you should really try to find the foods that use the least amount of processing. The problem with the cheapest dog foods are they are heavily processed and contain only a small amount of real meat. In some cases the really cheap dog food that you see on the supermarket shelves can barely sustain your dog. There isn’t a lot of real meat in these products. The majority offer a combination of corn and soy along with meats that aren’t suitable for human consumption. The best cheap dog food will offer middle-of-the-road pricing without sacrificing quality. Both owners and their dogs love Taste of the Wild dog food. It offers a balanced diet that was intended by nature and offers a combination of roasted meats such as chicken, lamb and bison. You won’t find any grains in these foods! If you dog has digestion issues you may want to give this one a try. It’s not an expensive dog food yet provides special canine probiotics, and amino acids, antioxidants, Omega fatty acids, a variety of vegetables such as peas, potatoes and sweet potatoes and prebiotic fiber. The Pine Forest® formula provides a minimum of 28% protein and a minimum of 15% fat. It’s available in different sizes and is a great food that tends to keep both dogs and their owners happy. Diamonds are notorious for being one of the most prized gems and being my best cheap dog food. This brand is one of the best affordable dog foods available on the market today. You’ll have plenty of choice when it comes to the size and flavor that you want to buy. 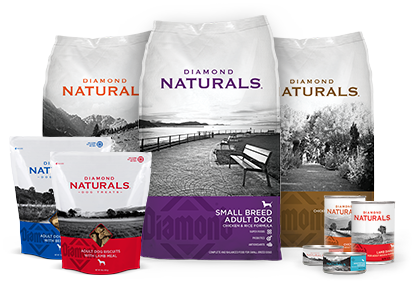 No matter what size your dog is, there’s a Diamond Naturals food that will match his breed and hopefully his flavor preference! This type of dog and puppy food contains healthy ingredients such as flaxseed to provide fiber and Omega 3 benefits along with chicken, beef or lamb meal that offers high amounts of protein. For example, the Adult Lamb and Rice dog food for small breeds contains lamb meal and lamb. This lamb meal provides a protein concentration that is approximately 300% higher than what you’d find in lamb meat. 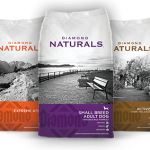 Diamond Naturals should not be confused with the other Diamond brands which are an inferior product that may use wheat, soy or corn in their formulas. As well, the Naturals food uses steam purified water when the food is manufactured Only natural preservatives are used and the meats are free of antibiotics and hormones. Best of all, you won’t have to dig down too deep into your pocket to afford this cheap dog food. This brand is and always has been one of the best cheap dog food options. There’s a good chance that you’ll find it stocked on the shelves at your veterinarian’s since it is highly recommended by many vets. This doesn’t mean, however, that you should pay the high prices that most vets charge for the product. You can get it much cheaper in stores or online from Amazon and there are always Science Diet coupons available to help keep the prices down. While the Diamond Brand of Food is generally slightly cheaper, you won’t have to pay more for Science Diet if you shop wisely. 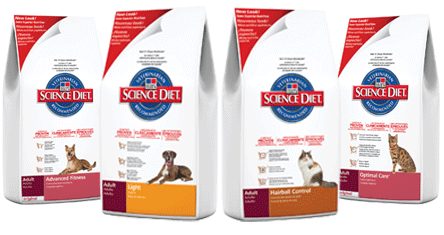 Science Diet uses whole meats in the preparation of this affordable dog food and in most of their products beef or chicken is the first ingredient. This food helps to maintain your dog’s immune system, skin, muscles etc. Along with the high animal protein levels you’ll also find Omega fatty acids, making this cheaper dog food one of the best around. Hills is located in the United States and has higher than average industry standards. Only ingredients that come from Europe, New Zealand and North America are used in the preparation of their dog foods. 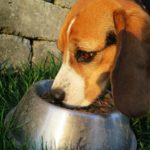 If you have a small dog, you may be interested in their “Small Bites” food. Many little dogs have a hard time managing the larger kibbles. The smaller bites are much more appropriate for little dogs with small mouths and can be especially beneficial for older small breed dogs that are experiencing dental problems or are missing teeth. You can supplement any of the above recommended cheap dog food brands to add additional benefits. Bone meal is a powdery substance that is made from the bones of various animals. It contains high amounts of phosphorus, protein, fat and calcium that helps maintain bone and teeth health. This can also help with diarrhea, gas, the absorption of nutrients and overall digestion. It is a good idea to also feed your dog fish oil along with the bone meal for better metabolization. There is a large variety of fish oil supplements available for your pet. One of the best is the Grizzly Salmon Oil since it provides a wide variety of Omega-3 fatty acids, vitamins and antioxidants. Most dogs appreciate the Salmon oil being dripped on top of their dog food and view it as a special treat. This is an all-natural source of Omega-3 acids that will help stimulate the immune system and the heart. As well, if you have noticed that your dog’s coat doesn’t have as much luster, this salmon oil will make your dog’s fur glow again. When you supplement with bone meal or salmon oil, you are bringing your dog’s diet up to a brand-new level. You won’t have to worry about purchasing the most expensive foods for puppies and dogs on the market. You can purchase one of the lesser priced dog foods yet know with confidence that you’re providing your very best friend with a complete and balanced diet. Homemade or raw dog food is definitely one of the best cheap dog food options available. 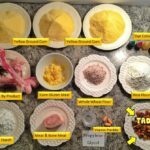 Once you have investigated a few recipes you’ll see just how easy it is to throw together some dog food. You’ll have 100% control over what you’re feeding your dog. If you watch for meat sales at your local grocery store this can be a very affordable way to feed your dog. Of course, not everyone has the time available to make their own homemade dog food and that is fine. The cheap dog foods listed above also make the grade when it comes to providing the correct nutrition that your dog really needs to stay happy and healthy. Most of the cheap dog foods found on the grocery store shelves should are not good options for your dog. They may make your dog feel full but that’s about it. When looking at the ingredients in these dog foods you’ll notice that they have a lot of corn in them. Corn really doesn’t add much nutritional benefit at all. As well, in most cases, the corn used is not even fit for human consumption. Look for a dog food that’s easy on the pocketbook, supplies valuable nutrition and one that your dog absolutely loves. Don’t be afraid to supplement it with bone meal and fish oil. You don’t have to pay exorbitant prices. Some of the best cheap dog food options available will keep your dog happy and healthy. What is the best cheap dog food you use and why?